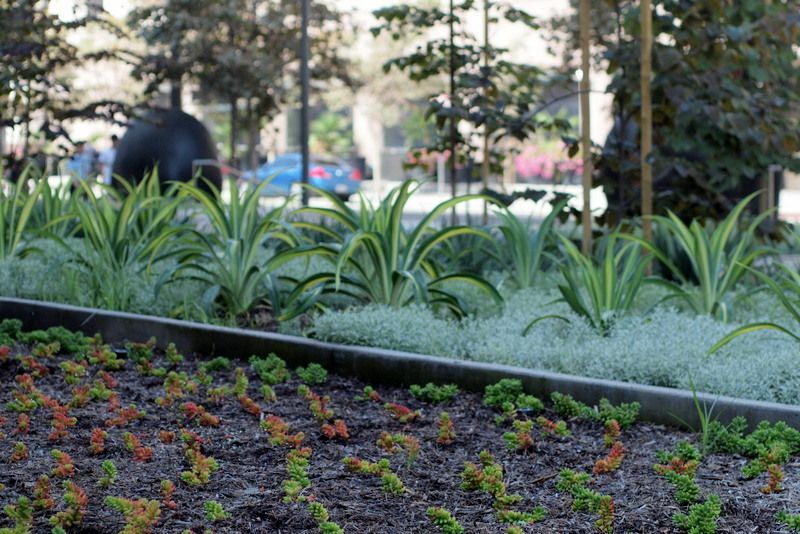 I stumbled onto another forward-looking example of civic landscaping in Downtown Los Angeles this week. Little did I know that in attempting to communicate my simple admiration for this landscape, I was also stumbling into an LA Confidential-style quagmire. The more I read, the more complicated this landscape became. 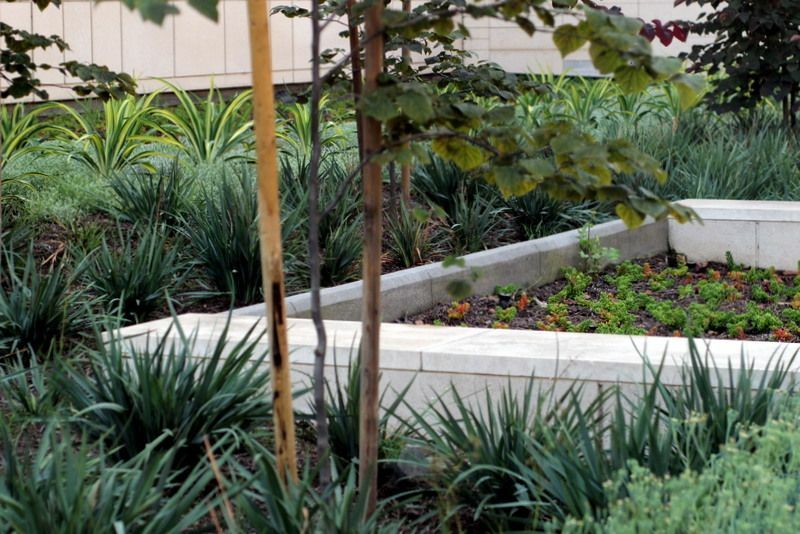 Briefly, for reasons explained in depth in links* at the end of this post, the plantings at the Los Angeles Police Department’s new headquarters have been beset by controversy over maintenance failures since unveiling in 2009. 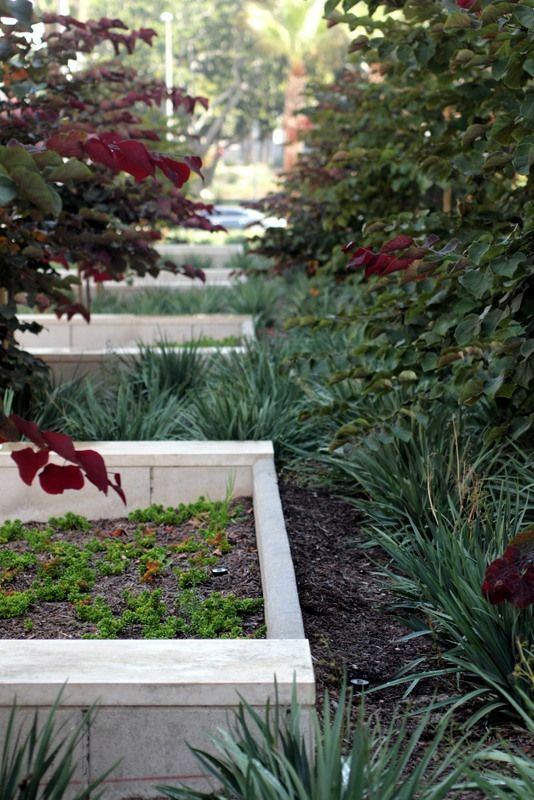 This side of the building seems to be either a later or revised planting that appears to be in beautiful shape. So putting all that aside for now, here’s what’s visible today on the Spring Street side of LAPD’s new HQ. I know architects love sweeps of lawn to show off the lines of their work (and thereby obstruct views of it as little as possible), but if you want that shiny LEED certification for your new building, the lawn has to go. I find it ironic that it took restrictive water supply issues to finally shake up staid and predictable plant choices. 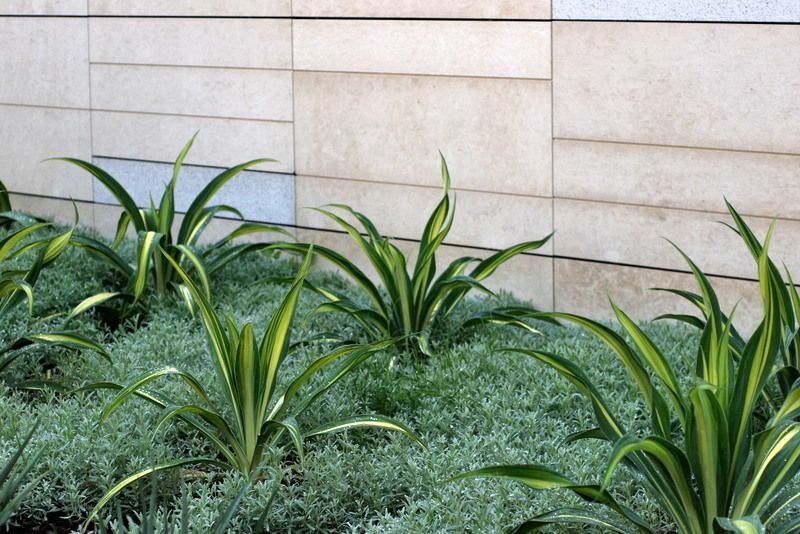 There’s no way this landscape would be as visually arresting had the new LAPD HQ’s clean lines and alabaster, horizontal planes been complemented by the standard repertoire of plants in use even ten years ago. Which means a glass-half-empty problem has been transmuted into an exciting landscape brimming with form and color. It was these colors, deep burgundy and icy blue, that prompted the detour from my intended destination, the Metro Rail station, heading home yesterday. 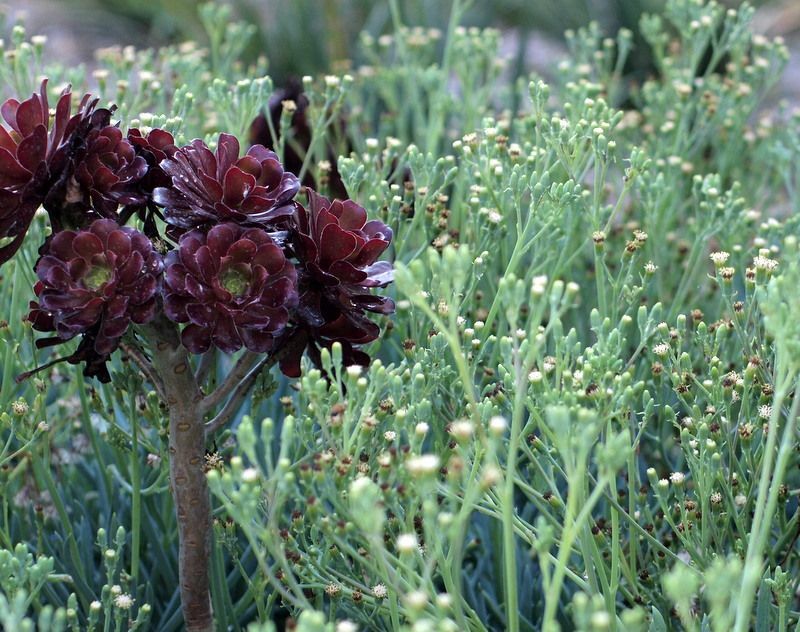 Dark red aeoniums dotted through the blue chalk sticks, Senecio mandraliscae. I swung around quick for a closer look. Bees were all over the senecio’s modest blooms. In this case, modest blooms are a good thing. Nothing to interrupt the strong shapes and colors, and much less upkeep too. 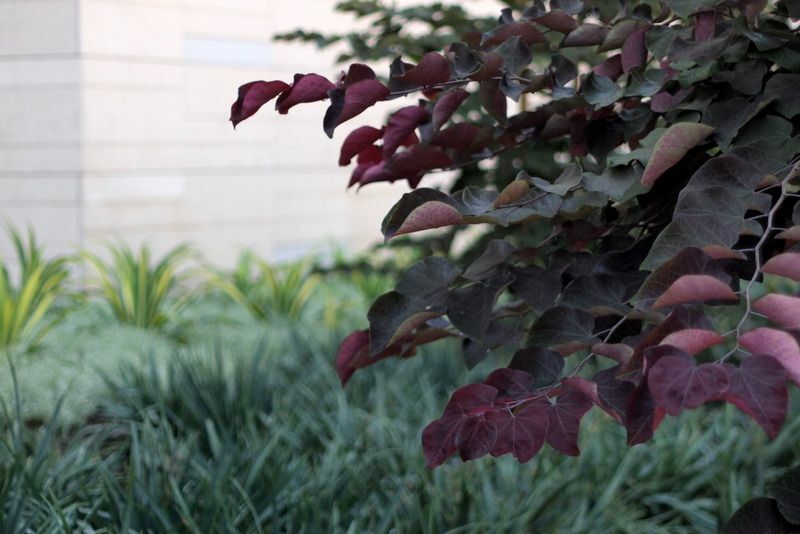 The cercis are planted in a double row, seen when standing at the back of one of the low walls/benches. 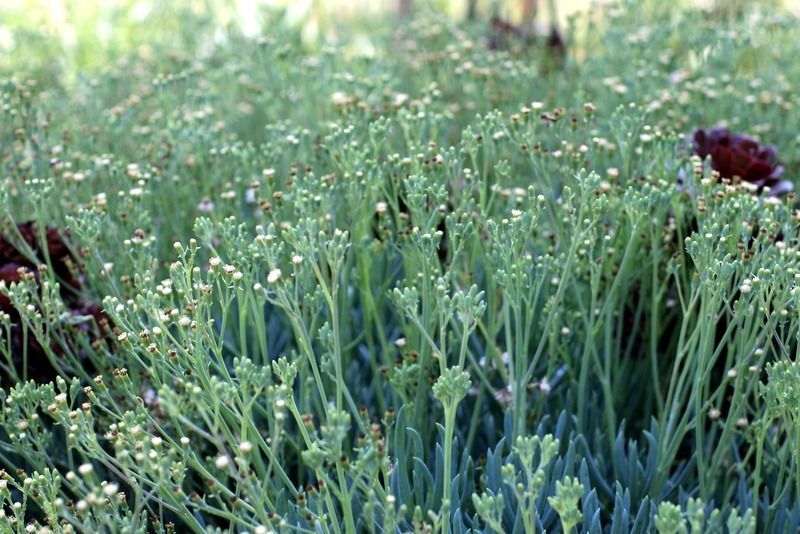 The pork and beans plant, Sedum rubrotinctum, fills the back of the planters. Blue Dianella tasmanica are massed behind the chalk sticks. 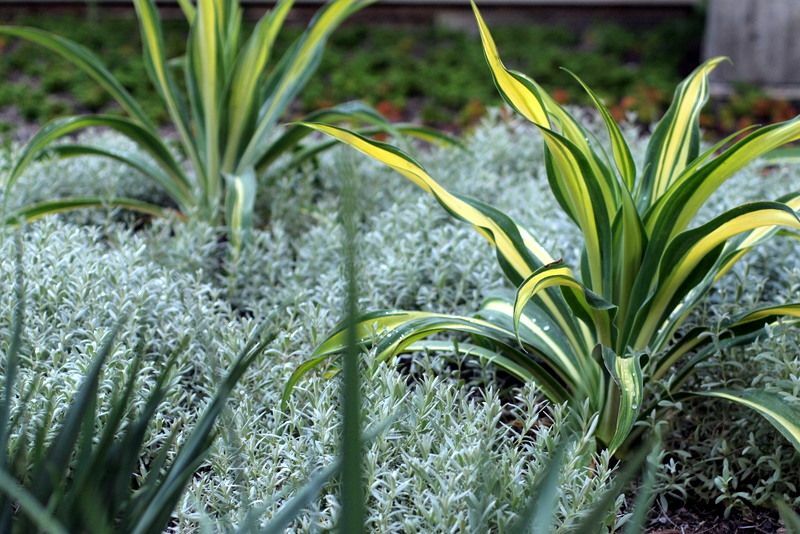 Beyond the planters, what I first thought were Beschorneria yuccoides ‘Flamingo’ turned out to be furcraeas massed amongst silvery Cerastium tomentosum. Furcraea foetida ‘Mediopicta’ or Beschorneria yuccoides ‘Flamingo,’ either one is a great choice here, though the beschorneria’s exotic bloom spikes would require more upkeep. 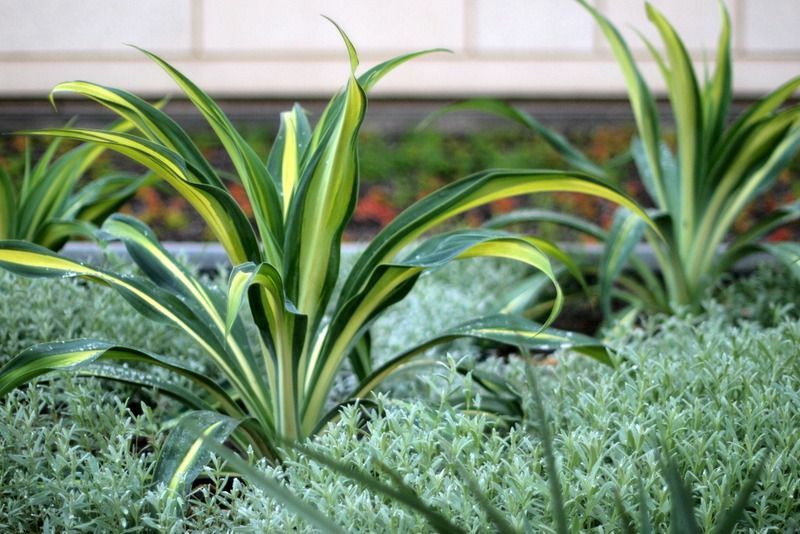 Sedum rubrotinctum can be seen behind the furcraea, a warm-colored ground cover anchoring the building. The sedum is filling in slowly. 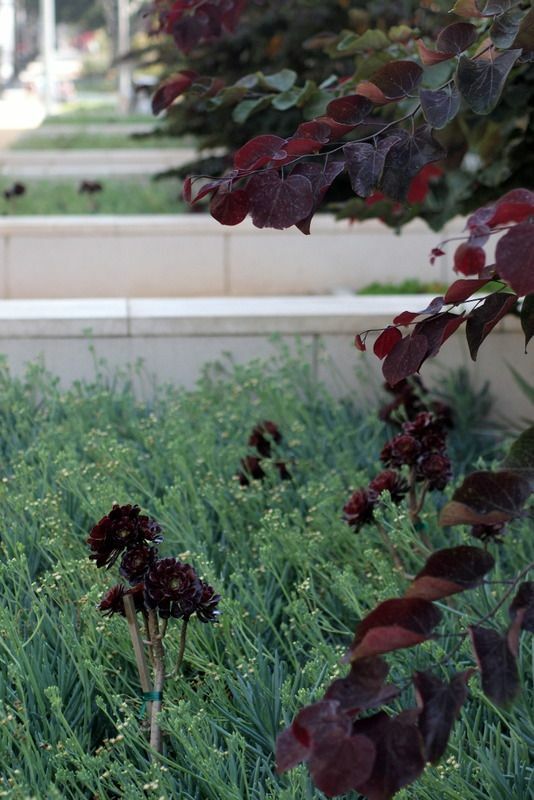 While the cerastium romps and will need to be regularly kept in check. *As I mentioned above, there’s more to this story than meets the eye. All human interventions in ecosystems, be it a potted plant or a civic landscape, have to be looked after and maintained. And please don’t roll your eyes at this absurdly obvious fact, because it seems to escape some reasonably intelligent folks and therefore needs repeating. It’s obvious to us, the garden makers, but apparently maintenance wasn’t budgeted and appropriate funding allocated when this landscape was installed in 2009. I think my photos may depict a more recent installation or possibly a revision. Not long after the 2009 install, trees were collapsing, literally caving in because the soil mix was all wrong. 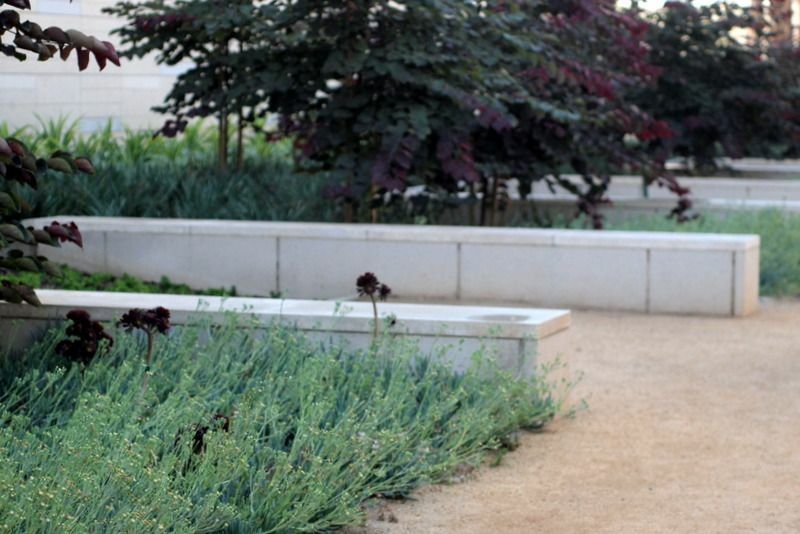 More on the LAPD HQ’s landscape controversy can be read here and here. 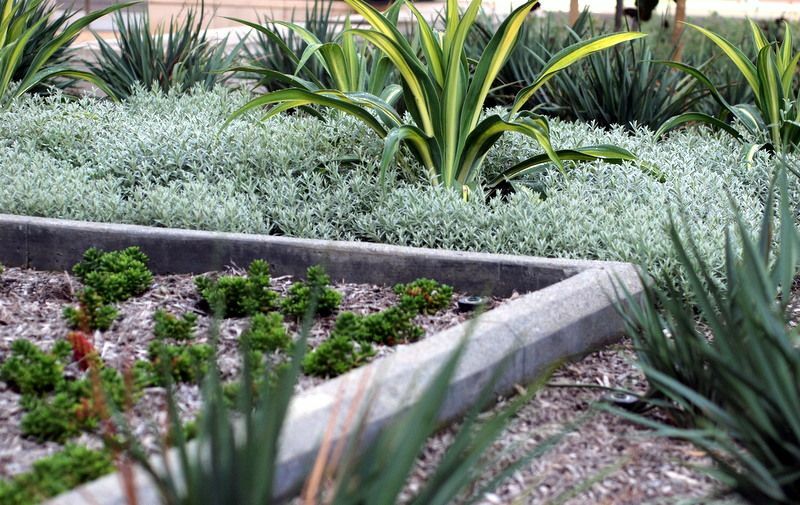 Reuben at Rancho Reubidoux has posted on the LAPD HQ several times, not including the above planting, which has me wondering if it’s possibly a revision of an earlier problem area. 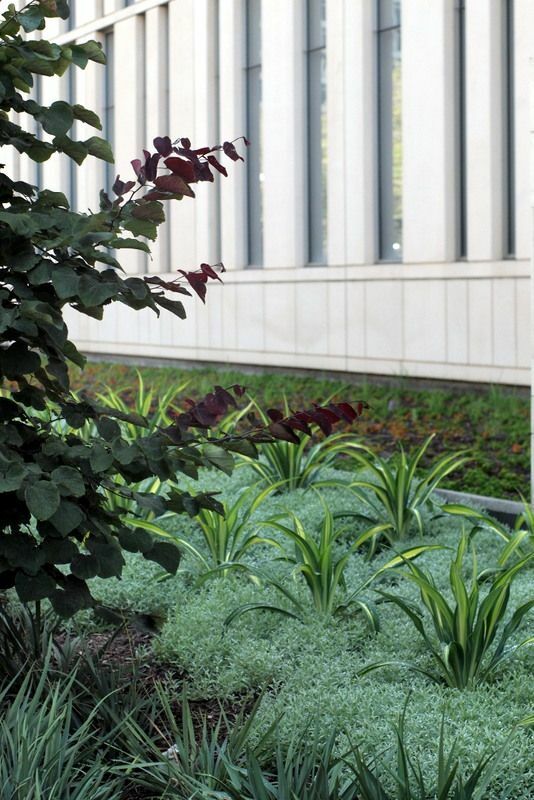 This entry was posted in design, driveby gardens, succulents and tagged Beschorneria yuccoides 'Flamingo Glow, Cerastium tomentosum, Cercis canadensis 'Forest Pansy', Dianella tasmanica, downtown Los Angeles, Furcraea foetida 'Mediopicta', LAPD headquarters, Sedum rubrotinctum, Senecio mandraliscae. Bookmark the permalink. 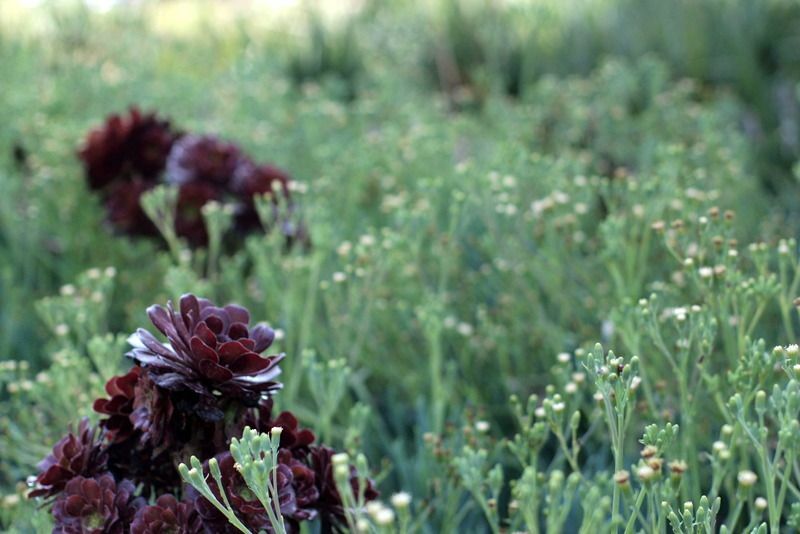 Ironically, Denise, this chalk blue-deep red, senecio-aeonium mix is part of the original plan. 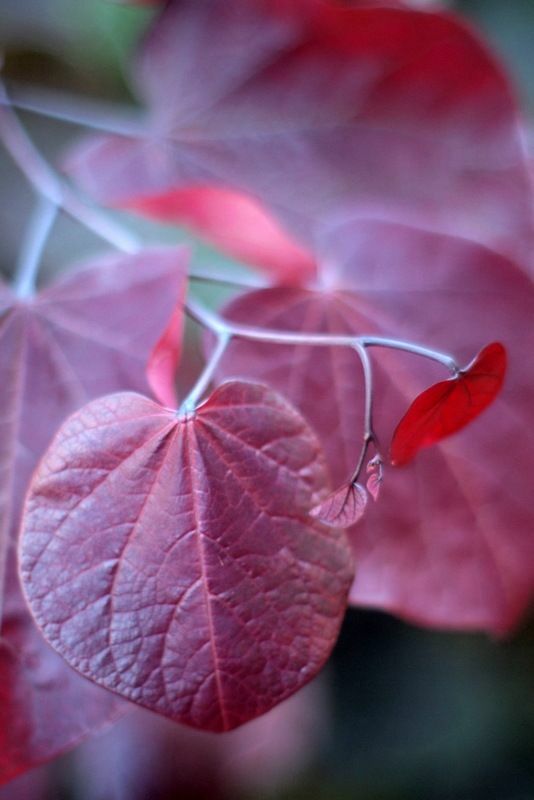 The deep red trees, the furcreas, etc., are not. Deanne, I love how it grounded the building in big washes of rich color. wait’ll the mow and blow guys hedge the tips off the Furcraeas. Love this! ‘Margaritaville’ yuccas would work well in place of the furcraeas too, I think. My company installed the new landscape @ P.A.B.The original contractor really made some major mistakes.After removing and demowork of original plant material we added over 200 tons of #20 silica sand amended the soil, corrected the irrigation and started from scratch.Spring Street looks fantastic and really is almost shaded all day.I really like the use of aloes & agaves on the main entrance @ 1st Street. If you walk up into the Memorial Garden you will also see a really nice plant detail with the Aloe Hercules as the achors in the center planter.WE added 3 more valves in the south lawn area so the turf should rebound and the dogs will be happy.The entire project (includung the roof garden )turned out really well and the entire crew at Sun-Scapes are proud of our hard work.We just turned the project over to Parks and Recreation and they are now resposible for the maintenance .